The manufacturer will supply and install four units of its V136-4.2 model with 82-metre towers for Danish developer Hirtshals Havneford’s 17MW project. Hirtshals Havneford has secured a short-term power purchase agreement with electricity company Energi Danmark for the wind farm in the Port of Hirtshals in northern Denmark. 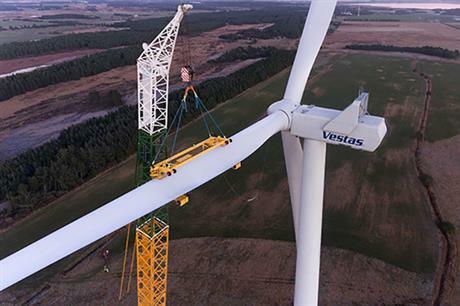 This will help enable the project to be built without subsidy – a first for onshore wind in Denmark – Vestas stated. The developer will also sell shares in one of the turbines to local citizens and organisations. Vestas’ global senior vice president for marketing, communications and public affairs, Morten Dyrholm, said: "This order shows that onshore wind has now reached a point where projects are possible on market terms if we can put up the newest technology." The manufacturer will also provide operations and maintenance services for the project for 20 years. Delivery and commissioning is expected in the fourth quarter of 2019, Vestas stated. The order follows Denmark’s first energy-neutral auction in November 2018, in which premium prices for onshore wind fell 84% from the previous grant price. Vestas’ Dyrholm added that this, as well as the development of a subsidy-free onshore wind farm, demonstrates Denmark’s ability to "ensure a successful energy transition".